No 1 in Italia. Suitable for vegetarians.Our mozzarella is an Italian classic. With a fresh, delicate taste and creamy texture, it's a staple in family kitchens everywhere. Perfect for any occasion, from light salads to bubbling pasta bakes. Scatter hand-torn pieces of our tasty mozzarella over your home baked tomato pizza, with vibrant basil and virgin olive oil. Made with pasteurised cow's milk. Suitable for vegetarians. 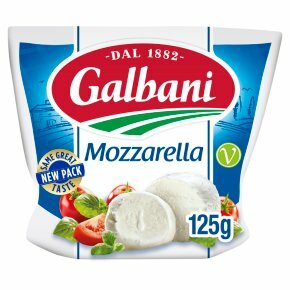 Galbani® is Italy's favourite cheesemaker, producing many of Italy's most loved cheeses since 1882.